It’s listed as the top game in the Windows Phone 7 Marketplace. If you haven’t played it already chances are you’ve heard of it. 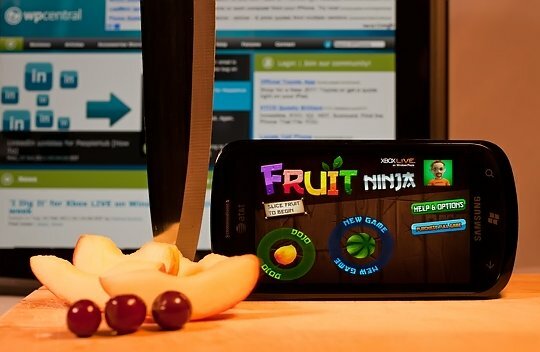 Fruit Ninja is one of the most talked about mobile games this side of Angry Birds. Ridiculously simple to play and as addicting as all get-out, Fruit Ninja is a favorite of adults and kids alike. There is a lot of hype around Fruit Ninja, and without a doubt it is one of the best all around games in the Marketplace, but what makes it stand out from the rest? Keep reading for the full review. The premise behind Fruit Ninja is simple. As various fruits fly across the screen, you swipe your finger across them, slicing through them. Bombs are bad (generally), so try and avoid hitting them. As you get better at slicing individual fruits, try and get combination's of multiple fruits in one slice. Different combos will gain you more points, and some will even unlock achievements. The game’s interface really feels natural, especially with a device featuring a large screen like the Samsung Focus or HTC HD7. The graphics are simple enough that the game is smooth, but the 3d effects and the various fruit splatter add an element of cartoonish realism. Though the game is easy to pick up, it’s not without challenges. I’ve been playing the game since it was launched and have yet to unlock some of the achievements. 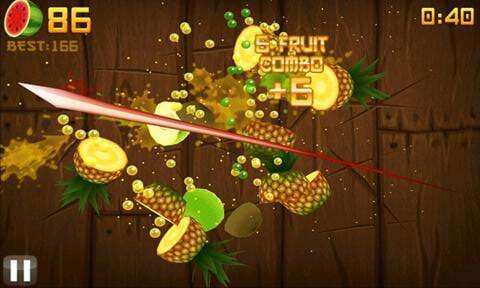 Fruit Ninja features three different game modes. Classic mode allows you to play for an unlimited amount of time, though dropping three fruit results in the end of the game. Hitting bombs in classic mode is also fatal. Zen mode allows you to play for 90 seconds with no bombs, making this a good option for the kids. Arcade mode has only a 60 second time limit but adds power-ups such as double points, frenzy, and freeze. Bombs also return in Arcade mode, but they are non-fatal, though they do impact your score and end whatever power-ups you may have acquired. 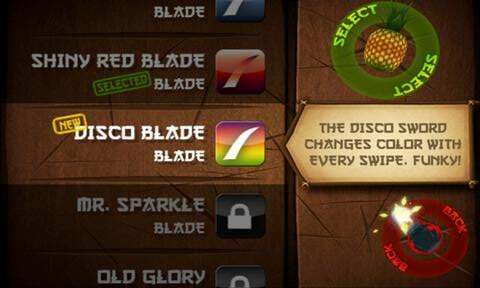 In addition to achievements, Fruit Ninja has additional in-game customizations that can be unlocked. Backgrounds and blades can be chosen in the dojo, adding additional character and color to the game. Fruit Ninja is one of those games that lend itself naturally to a touch-screen platform like Windows Phone 7. The $2.99 price tag is more than reasonable for a game that is so playable and immersive. If you haven’t tried it yet, get Fruit Ninja from the Windows Phone 7 Marketplace; it’s a must-have game for anyone with a Windows Phone. It’s listed as the top game in the Windows Phone 7 Marketplace, if you haven’t played it already chances are you’ve heard of it. Fruit Ninja is one of the most talked about mobile games this side of Angry Birds. Ridiculously simple to play and as addicting as all get-out, Fruit Ninja is a favorite of adults and kids alike. The premise behind Fruit Ninja is simple. As various fruits fly across the screen, you swipe your finger across them, slicing through them. Bombs are bad (generally), so try and avoid hitting them. As you get better at slicing individual fruits, try and get combinations of multiple fruits in one slice. Different combos will gain you more points, and some will even unlock achievements. 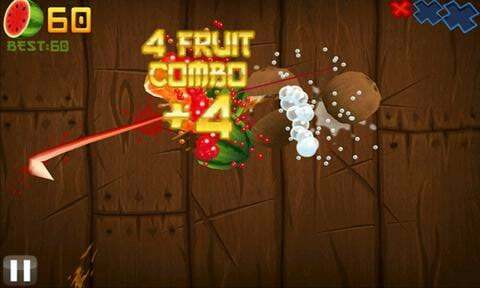 Fruit Ninja is one of those games that lend itself naturally to a touch-screen platform like Windows Phone 7. The $2.99 price tag is more than reasonable for a game that is so playable and immersive. If you haven’t tried it yet, get Fruit Ninja from the Windows Phone 7 Marketplace (Zune link); it’s a must-have game for anyone with a Windows Phone.